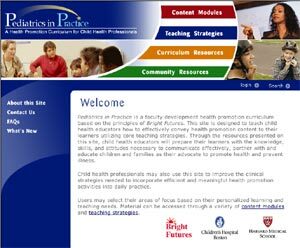 Pediatrics in Practice is a faculty development health promotion curriculum based on the principles of Bright Futures. This website is designed to teach child health educators how to effectively convey health promotion content to their learners utilizing core teaching strategies. It integrates various Internet design and production techniques including audio streams, Flash animation, and interactive e-learning modules.